Junior setter Madison Maynes and senior middle blocker Katelyn Winiecki block a spike against Redlands Tuesday night during the pink out game at Frantz Athletic Court. The Leopards beat the Bulldogs, 3-0, while wearing pink jerseys for Breast Cancer Awareness Night. / photo by Melody Blazauskas. The La Verne Leopards’ energy helped them get a bounce back win against the Redlands’ Bulldogs in a three-set sweep, 3-0, Tuesday at Frantz Athletic Court. Both the Leopards and Bulldogs looked to find some life after having lost two straight matches the week before. The Leopards’ losing streak comes after a stellar five-match winning streak. 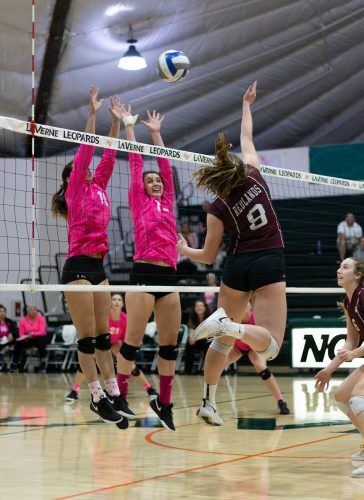 La Verne faced nationally-ranked Claremont-Mudd-Scripps on Saturday, losing in a 3-0 sweep. But even in that match, the Leopards saw bright spots in their game that would translate to future games against various opponents. “The Claremont game, specifically, really helped us understand that we can have small wins that are going to put the W in the win column,” head coach Jenna Panatier said. On a night the Leopards wore pink jerseys for breast cancer awareness, senior outside hitter Kelsie Sievers made the first kill to open the set against Redlands. The Leopards went on an early 4-1 lead on another Sievers kill the Bulldogs could not respond to. La Verne kept their composure and communicated early in the set that helped them throughout the whole matchup against Redlands. An early 7-3 Leopard run included a forceful kill by freshman outside hitter Haley Celaya to start and a kill by senior middle blocker Katelyn Winiecki to bring the score to 11-4. The Leopards continued their dominance as they extended their lead to double digits. Junior setter Madison Maynes made a simple kill that could have been returned by the Bulldogs which made the score 14-4 then Winiecki extended the double-digit lead to 15-4 with a kill assisted by Maynes. During many of the rallies for La Verne, senior libero Kristen Sanchez could be seen communicating with teammates to get to spots to make good plays. Redlands freshman setter Tati Luevano tried to shift the momentum with a kill to get the deficit to 16-6. Though the Bulldogs attempted to get themselves back in the game by getting the lead down to nine on an attack error on junior outside hitter Darrah Jones at 18-9, the Leopards could not be stopped. The Leopards extended the lead back to double digits and made the set point, 25-12, on a Winiecki kill. The Bulldogs responded better in the second set as they were loud with chants and encouragement for their teammates while also communicating well on their side of the net. A sneaky kill by the sophomore middle blocker Hannah Lanyon gave the Bulldogs a 4-3 lead. It was a close score early as both teams kept exchanging close leads and ties. On a service error by Redlands sophomore defensive specialist Emily Vankoll, the set was tied at 5-5. Following a service ace by junior defensive specialist Lauren Lux to tie the game at 7-7, the Leopards went on a 2-1 run that was highlighted by a Winiecki kill on a Maynes assist and kill by the Bulldogs’ junior middle blocker Sofia Olsson. A block and return party between the Leopards and Bulldogs ended with a kill by junior outside hitter Darrah Jones to give the Leopards a one-point lead at 13-12. La Verne then finished the set on a 12-6 run. Some highlights from the Leopards’ run were Sanchez’s ace for a three-point 15-12 lead, a huge Winiecki and Sievers’ block to make it a four-point lead at 19-15, a kill by Sievers to extend the lead to 21-15, and the last two La Verne points on kills by Maynes. The Leopards won the second set 25-18 following Maynes’ final kill of the set. The Bulldogs took an early 3-1 lead as they took their time to set up plays on their side of the net to start the third set. Redlands played with a sense of urgency as they attempted to keep their lead up at 5-3 on a kill by junior right side hitter Maloree Kupp. A kill by Maynes brought the Leopards within one at 5-4 as the Leopards played to keep the game tight to get over the hump. La Verne went on a 6-2 run that was capped off by a Sievers kill to be up 10-7. The momentum worked in the Leopards’ favor as they continued to communicate and hustle to keep the ball alive. “What helps us keep our momentum up lately is just reminding ourselves that if you make a mistake, or that play was a really good play, that play is over. We have to move on,” Sievers said. Briana Voght, junior middle blocker, made a kill that was the attack heard all through the gym that gave the Leopards a 12-9 lead. Voght further extended the Leopards’ lead to 14-10 then senior defensive specialist Teagan Griffiths added to the lead with an ace to make it 15-10. Though the Bulldogs were making strides in the third set, the Leopards were clicking on all cylinders to continue their lead. La Verne went on a 10-9 run to finish the set. In that run, freshman outside hitter Hannah Ruiz connected on a kill that the Redlands players could not respond to, stretching it an 18-13 lead for the Leopards. The Bulldogs then got within two at 20-18 on a kill by freshman outside hitter Paige Davidson. Maynes then responded with a kill to go up 21-18. On a rally between both teams, Celaya saved the ball for the Leopards and Sievers was able to connect on two kills in a row to make the score 24-19. The set ended on a service ace error on Davidson to seal the Leopards’ win 25-19. The Leopards’ were in good spirits following the game as they were pleased with the poise and energy that they played with. “Everyone was having fun and that’s the most important part of the game that we sometimes forget,” Celaya said. The win puts La Verne at 6-5 in the Southern California Intercollegiate Athletic Conference, good for sixth place, and 14-9 overall. Beating Redlands also made them hopeful that they could make it into the SCIAC postseason tournament. “In order to do that we have to win the rest (of the games this season),” Winiecki said. The Leopards will now travel to Pasadena to take on the last place Caltech Beavers at 7 p.m. Friday. Caltech is still looking for its first win of the season. La Verne’s next home match will be at 4 p.m. Saturday against Occidental, which is in seventh place in SCIAC with a 2-8 conference record.